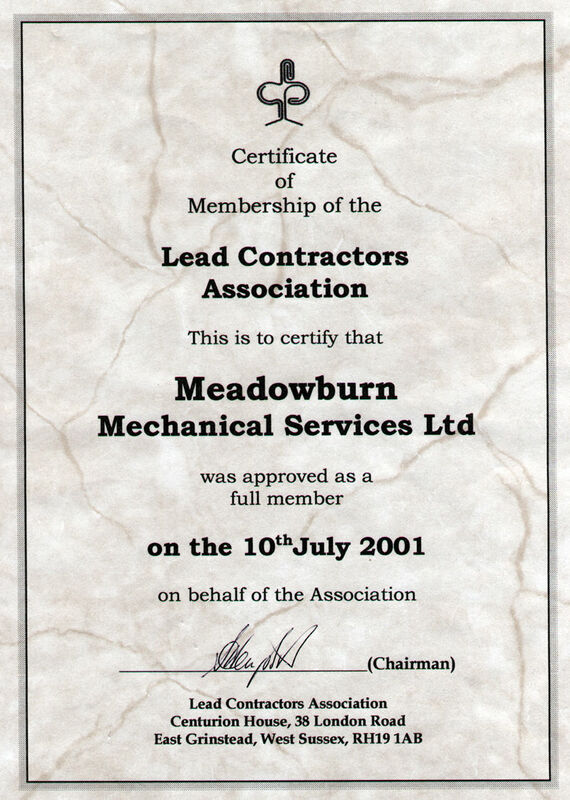 Meadowburn Mechanical Services Ltd is a member of the Lead Contractors Association. 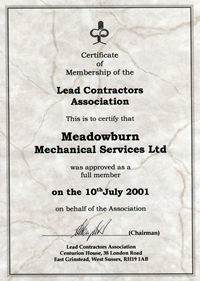 LCA was formed in 1984 to prioritise quality standards in leadwork. LCA now comprises over 100 specialist contractors committed to providing quality craftsmanship for their clients, supported by 15 associate members supplying materials and ancillary services. All members are required to work to the current Code of Practice (BS6915) and the recommendations of the Lead Sheet Association. With the launch of the Guarantee Scheme on 1st August 1999, LCA members made a public, long term commitment to their clients on quality standards. Under the scheme, an LCA member is required to offer a twenty five year guarantee of workmanship and material for leadwork projects over a value of £2,500. The scheme is insurance backed and underwritten through Lloyds of London to provide financial security through an independent Trust Fund of £250,000, where details of each project must be separately registered by the LCA member concerned and a nominal Registration Fee paid. All projects thus registered remain covered by the guarantee, regardless of whether the contractor involved remains a member of the LCA.